Be the first to share your favorite memory, photo or story of Joseph John. This memorial page is dedicated for family, friends and future generations to celebrate the life of their loved one. 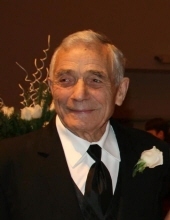 Joseph John Friederick went to God’s embrace on February 2, 2019 in Lancaster, WI, at the age of 87. His gentle soul and giving heart reached the lives of many. Born on November 16, 1931 in Dubuque, IA, to LeRoy and Mary (Bies) Friederick, Joe acquired an innate work ethic at a young age. He attended a one-room country school through eighth grade and on his own initiative, joined the marines at 17 and served in the Korean War from 1949-1953. As one of the few survivors of the Chosin Reservoir conflict, he returned to Iowa and started farming. Mary Abing quickly became the love of his life and they joined in marriage on January 8, 1955 for 59 dedicated years. Together they created a prosperous dairy and hog farm outside of Lancaster. The Friederick Farm was the recipient of numerous milk quality awards, the WGLR 1992 Farm Family of the Year, and the host of the 1992 Grant County Dairy Breakfast. Other community involvement included his active membership to the People’s Oil Co-Op Board for 18 years, VFW Post 2344, and an especially strong commitment to St. Clement’s Catholic Church. His never-ending strong faith was exhibited in Sunday ushering, bible studies, volunteerism and consistent visits to people in need. Together he and Mary enjoyed traveling, hosting company and countless family events. A fond memory for Joe was his Honor Flight to Washington D.C. in 2013 as a Korean War veteran. Joe was a humble person but gained overwhelming admiration through the love people felt for him. Joe’s giving nature continued through his retirement years as he drove a DAV vehicle for veterans, helped neighbors and held an open door for any family need. Always wanting to stay busy, Joe attended numerous card clubs, especially euchre, played scrabble games and even mastered computer literacy in his later years. He was very appreciative of his companionship with Joanne Kemps as they attended many activities together. Joe adored his very large family and it was the center of his life. He was a loving husband, father, grandfather, brother, uncle and friend. Joe was always present for his five children: David (Lidia) of East Dundee, IL; Keith of Lancaster; James (Sherry) of Huntington, WV; Bruce (Sharon) of Lancaster; and Andrea (Stuart) Dodds of Chaska, MN. He will be missed dearly by his brothers, brothers-in-law, sister and sisters-in-law: Esther (Clete) Kruser of Hazel Green; Florence Friederick of Fennimore; Pat Friederick of Tennyson; Carol Friederick of Potosi; Ken (June) Friederick of LaMotte IA; Janet Friederick of Cassville; Carl (Carol) Friederick of Hazel Green; Marilyn Abing of Platteville; Rosalyn Hartung of Madison; Harriet Snyder of McHenry, IL; Carl (Beth) Abing of Cassville; Karin (Steve) Peacock and Allen (Jan) Abing of Platteville; Michael (Kim) Abing of Fennimore. Joe loved to spoil his 13 grandchildren and eight great-grandchildren: Roshae (Matt), Jana (Carl), Danielle (Jeremy), Jamie, Stacy, Tom (Amanda), Dana (Otis), Ellen (Bryant), Claire, Alec, Sam, Jaren, Colden, Morgan, Hunter, Allison, Jenna, Brady, Joseph, Amelia and Vivianne. In addition to his parents and loving wife, Mary, Joe was preceded in death by his brothers and sister: Ralph, Earl, Don, Leo and Shirley Friederick; sisters and brothers-in-law; Patricia Abing, David Abing, Richard “Pete” Snyder, Vincent Abing, and Paul Hartung, nephews Craig Alan and Michael Vincent Abing, Roger, Micah and Dennis Friederick, Paul Snyder, nieces Sarah and Mary Ann Friederick. A Mass of Christian Burial will be held at 11:00 a.m., Saturday, February 9, 2019 at St. Clement Catholic Church in Lancaster with Fr. William Vernon officiating. Burial with Military Honors will be in the St. Clement Cemetery. Family and Friends may call from 4:00 p.m. until 8:00 p.m. on Friday, February 8, 2019 at St. Clement Catholic Church, where a 3:45 p.m. parish scripture service will be held. Visitation will also be held on Saturday, February 9, 2019 from 10:00 a.m. until time of services at the church. In lieu of plants and flowers, A Joseph John Friederick Memorial Fund has been established. The Martin Schwartz Funeral Home & Crematory of Lancaster is entrusted with his services. To plant a tree in memory of Joseph John Friederick, please visit our Tribute Store. Military Honors will be performed at the cemetery. "Email Address" would like to share the life celebration of Joseph John Friederick. Click on the "link" to go to share a favorite memory or leave a condolence message for the family.